Tt eSPORTS began making its mark on mechanical gaming keyboard in 2010, with the first MEKA series - the MEKA - to the milestone sensation - the MEKA G1. Tt eSPORTS coordinates all creativities and possibilities to continue its legacy so each competition can be performed at its best. 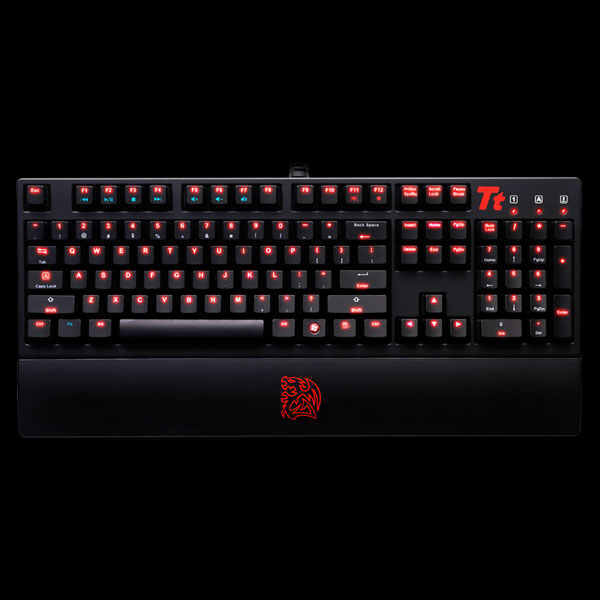 In 2012/2013 mechanical pro-gaming keyboard collections, Tt eSPORTS introduce the MEKA G1 Illuminated edition. Maintaining its best built-quality and durable Military Grade 1.5 cable, and the fan-favorite 1000Hz polling rate, the Illuminated edition further offers you dynamic pulse-break backlight system in 7 illuminating levels. The CHERRY MX Black switches offer 60-80g of pressing force, ideal for those who enjoy it in their gaming process. Its high compression point acts as additional error-free security when pressing. Red LED bulb in each key of the Illuminated edition, gamers can visually experience the differences from its predecessor. Fn + F12: To adjust the keyboard brightness in 7 levels, and switch to pulse-break lighting effect. Instant audio control: pause/play, forward/backward, volume and mute. Your each keystroke will never go wrong. MEKA G1 Illuminated pro-gaming mechanical keyboard.